Winter is about the only time of year that I can handle Lake Louise. Even then, it has to be super early in the morning, before the throng of tourists piles in. 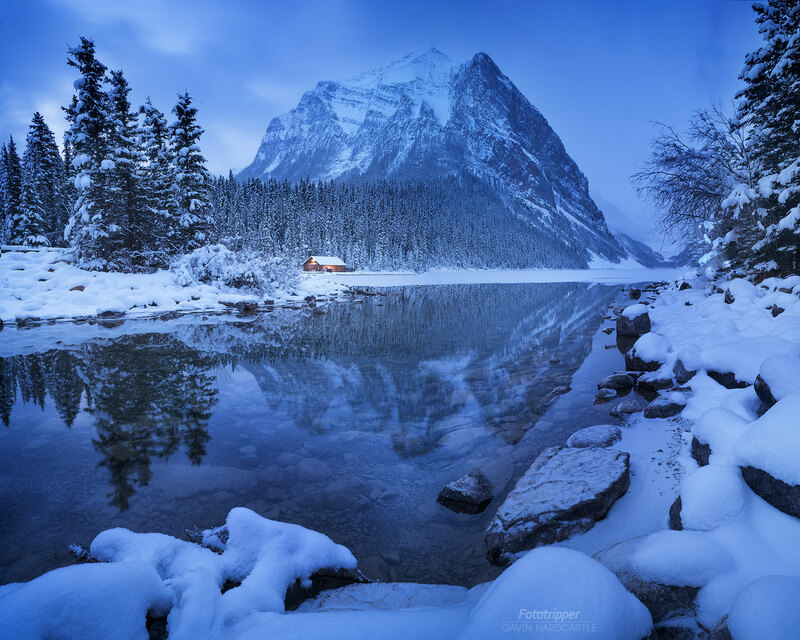 This morning blue hour shot was captured on one of those freezing cold winter days that I miss so much. This was actually Christmas Eve and was the best gift I could have received. I loved how the warm light in the boat house contrasted so well against the cold blue tones of the landscape. When I first arrived, I had little hope of capturing anything special as the clouds were heavy and snow was in the forecast. I’m so glad I waited. This shot is a stitched panorama of three vertical frames to capture the wide scene. That fresh dusting of snow in the trees made all the difference.